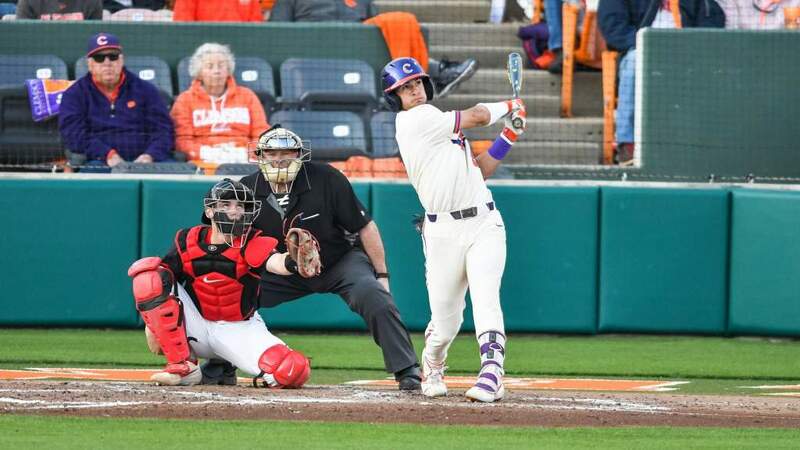 CLEMSON, SC – The Clemson baseball recruiting class that enrolled in school in August was ranked seventh in the nation by Collegiate Baseball, the magazine announced Friday. 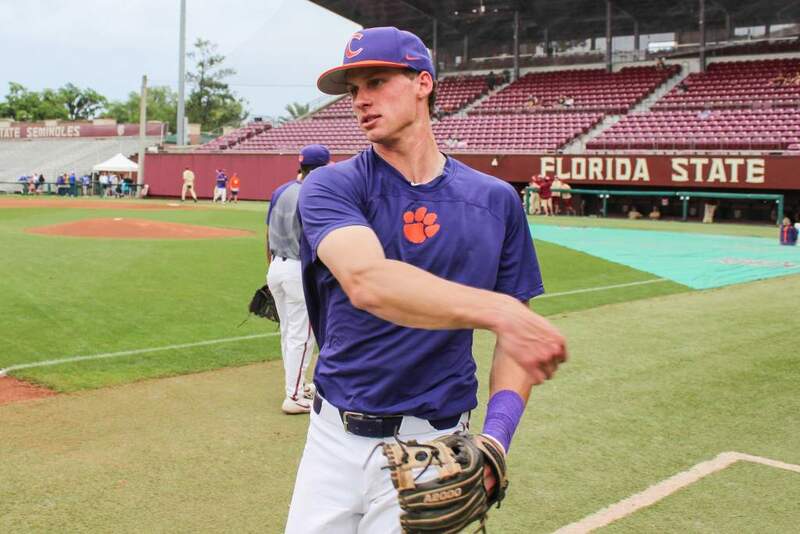 The class consists of 11 newcomers, nine freshmen and two junior college transfers, and features five players who were drafted in June’s MLB amateur draft. Tyler Lumsden was a fifth-round draft pick by the Florida Marlins. He is joined by other draftees David Slevin (11th, Rockies), Garrick Evans (23rd, Blue Jays), Bart Hunton (46th, Reds) and Collin Mahoney (48th, Angels). Clemson had the highest-ranked class in the ACC. Only two other schools were ranked in the top 30. Florida State was ranked ninth and Georgia Tech was ranked 14th. Full details of the top 10 recruiting classes are in the Oct. 5 issue of Collegiate Baseball. 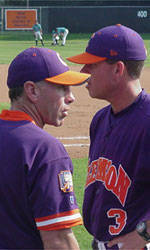 Clemson made its third consecutive appearance in an NCAA Super Regional in 2001 before losing to Miami (FL), the eventual national champion. The Tigers are just one of six teams in the nation to appear in the Super Regional round all three years of the expanded format. 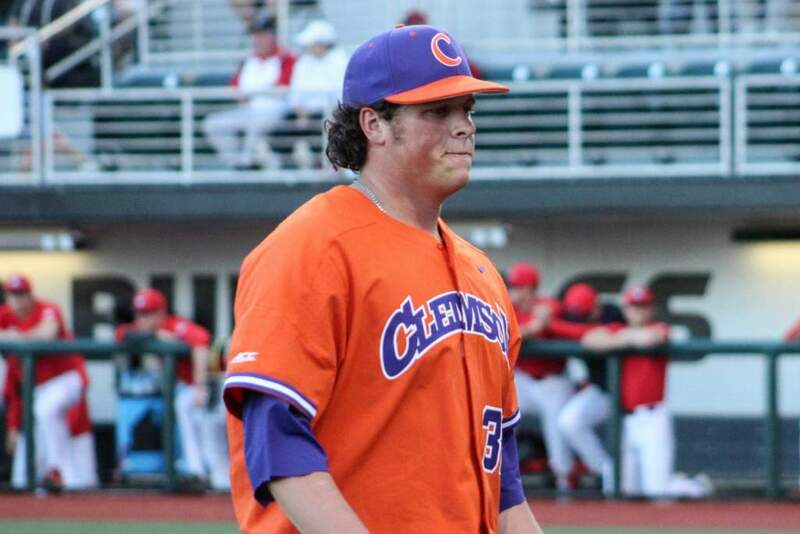 Josh Cribb P * 5-10 * 175 * Lake View High School * Lakeview, SC Before Clemson: Only South Carolina high school pitcher have perfect ERA in 2001Š member of 2001 North-South All Star team… led team to four conference titles and four South Carolina State titles… team holds state record with 49 consecutive victories… was named All-Region 1998-2001… three-year SCBCA All-State selection… named SCBCA State Player of the Year in 2001… named MVP in 2000 and 2001… USA Today Honorable Mention in 2000… lettered four years in baseball and two in basketball… coached by Kip Herlong. L.J. DeMaino OF * 5-11 * 165 * Miami-Dade CC * Danvers HS * Danvers, MA Before Clemson: Batted .338 for Miami-Dade Community College in 2001… finished third in Florida Junior College with 40 stolen bases… helped Miami-Dade to a 40-9 record and an appearance in the Junior College World Series… led Miami-Dade to Southern Conference Championship in 2000 and was a member of the All-Conference First Team… set single season record in at bats, runs scored, batting average, stolen bases, doubles, walks, wins as a pitcher and walks as a pitcher… set career records with most at bats, runs, hits, walks, stolen bases, and doubles…was a member of the 1999 NEC and Eastern Mass All Star teams…was named 1999 DHS Captain and MVP along with 1999 Boston Globe First Team All-Scholastic and 1999 Boston Herald First Team All-Scholastic awards…led DHS in 1999 to NEC Championship and Eastern Mass Championship. Jess Easterling SS * 6-1 * 170 * Hartsville High School * Hartsville, SC Before Clemson: Led Dixie Boys State to National Championship in 1997… member of AAU Diamond Travelers in 2000… in 2000 named All-Region, All-State, HHS Offensive MVP… in 2001 was on the IP All-Tournament Team and ranked the #1 shortstop in South Carolina… led team to Region V AAAA Championship in 1999-2001… lettered five years in baseball… coached by Jimmy White. Garrick Evans SS * 6-2 * 180 * Lake Braddock HS * Burke, VA Before Clemson: Drafted in the 23rd round by the Toronto Blue Jays… member of 1999 American Legion Team, went on to be league champions… member of the Northern Virginia Commonwealth Team and the Northern Virginia Barnstormers Showcase Team in 2000…Barnstormers won the National Baseball Federation World Series…was named Second Team All Patriot District and First Team American Legion All Star in 1999…led Lake Braddock HS in RBIs and American Legion team in homeruns in 1999…in 2000 was named Lake Braddock HS First Team All Patriot District, First Team All Northern Region, First Team All Times, First Team All Journal, and Washington Post Athlete of the Week…also in 2000, his HS team was Regular Season Champions, along with Patriot District Champions…lettered four years in baseball, three years in football and two years in basketball. Jeff Hourigan OF/P * 6-1 * 195 * Masuk High School * Beacon Falls, CT Before Clemson: Rawlings All-America and Gatorade Connecticut Player of the year as a senior… three-time all-state selection… Member of the American Legion Zone V and American Legion East/West All-Star Classic in 1999 and 2000… named team MVP his senior year… Also named MVP by the Connecticut Post and the New Haven Register… All-SWC Team in 1999 and 2000 and the MVP of the SWC in 2001… lettered four years in baseball, three years in basketball and two years in soccer… coached by Ralph Franco. Bart Hunton C/1B * 6-3 * 230 * Dublin Coffman * Dublin, OH Before Clemson: Drafted in the 46thround by the Cincinnati Reds… Lettered four years in baseball and batted .461 with 11 homeruns in 2001…had 34 RBIs and a .784 slugging percentage with just 7 strikeouts and 102 at bats… was a member of the Junior Olympic Trials, a CBA District Four HS All-American and ranked the seventh Top Prospect in the East Coast Professional Showcase in 2000… in 2001 was rated #1 prospect in Ohio by Baseball America, named Central District Player of the Year, Home Plate Club Player of the Year, Muzino All-Ohio and a member of Team Ohio in Sunbelt Classic… also in 2001 was rated 54th top prospect by Baseball America… lettered three years in football and was two years all-league and one year all-district as a linebacker/tight end… lettered one year in basketball… coached by Tim Saunders. Tyler Lumsden P * 6-4 * 187 * Cave Spring High * Roanoke, VA Before Clemson: Drafted in the fifth round by the Florida Marlins… member of the Virginia Commonwealth Games 1998-2000… part of the Chicago Cubs ECPBS and East Coast Prospects in 2000… was named All-District and All-Region in 1999 and 2000… was named number five prospect in the state of Virginia by Baseball America… led team to the District Championship in the 1999-2000 seasons… lettered four years in baseball and basketball… coached by Randy Boone. Collin Mahoney C * 6-3 * 220 * Mount Saint Michael Academy * Patterson, NY Before Clemson: Drafted in the 48th round by the Anaheim Angels… led team to New York City Catholic High School Champions in 2000… member of the Area Code Games in Los Angeles… named New York Daily News Player of the Year in 2000… two-time All Division New York City Catholic High School in 1999 and 2000… won Bayside Yankee Coaches Award in 1999… lettered three years in baseball… coached by his father, Bernie Mahoney. Daniel Pritchard 2B * 5-9 * 145 * Hartsville High School * Hartsville, SC Before Clemson: In 1997 led team to District, State and World Series Champions… member of Southern Baseball Classic All Tournament Team and International Paper Classic All Tournament Team in 2001… member of Region V 4A All-Region Team and Southeastern Baseball Classic All-Tournament Team in 2000… led team to Region V 4A Champions in 1998, 2000 and 2001… lettered four years in baseball… coached by Jimmy White. 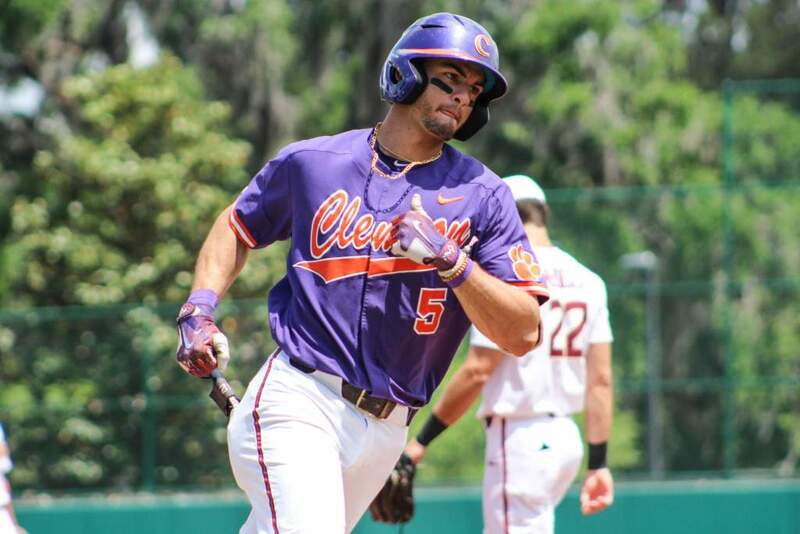 David Slevin 2B * 6-0 * 185 * So * Indian River CC * Ft. Pierce, FL Before Clemson: Drafted in the 11th round by the Colorado Rockies… batted .360 with 44 runs scored, 39 RBIs and four home runs at Indian River Community College in 2000… led the team in RBIs and hits as a freshman and was selected for the Florida Junior College All-Star game… also picked to the All-Southern Conference second team while leading his team to a 40-11 record and final national ranking of second… batted .452 with 37 runs scored and 33 RBIs and led the area in hitting as a senior at John Carroll High School… named the team’s offensive player of the year while gathering first team All-Area honors from the Palm Beach Post, Stuart/Port St. Lucie News and Ft. Pierce Tribune… also named to the Cobra Classic All-Tournament Team and was named Athlete of the Week by both Ft. Pierce News and the Ft. Pierce Tribune… led John Carroll High School to a 29-4 record and district championship in 1999… hit .489 and led the area in hitting as a junior… was named to the 2A All-State second team as a junior. Robert Valiente CF * 6-0 * 170 * Tampa Catholic * Tampa, FL Before Clemson: Batted .319 with 23 hits and 16 RBIs his junior year…was a member of the Hillsborough County All-Star Team in 2000… named defensive player of the year in 2000… lettered in baseball three years… coached by Chuck Yingling. Adam Walker P * 6-4 * 170 * Fr * Oak Ridge HS * Oak Ridge, TN Before Clemson: Named a TSSAA Coaches’ All Star and All-District in 2000… led Oak Ridge HS to a 36-22 record and second place finish in the district in 2000… All-District in 1999 when he was also the District ERA Champion… lettered four years in baseball and four years in golf… coached by Tom Froning.